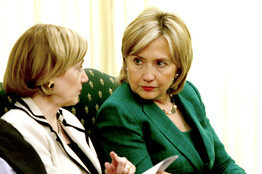 Hillary Clinton, right, speaks with Ambassador Anne Patterson during a meeting with Pakistan Premier Yousuf Raza Gilani in Islamabad, Wednesday. Mrs. Clinton, on the first day of a three-day diplomatic mission to Pakistan, said Wednesday that Washington will give $125 million to Islamabad for the upgrading of key power stations and transmission lines. U.S. officials said the initial disbursement is part of a broader effort by the Obama administration to stave off power shortages across Pakistan. They said blackouts are slowing economic growth and aiding the Taliban and other militant groups seeking to weaken President Asif Ali Zardari's government. "The Taliban can feed off the blackouts and claim the government isn't delivering services," said a U.S. official working on the power program. U.S. experts are also beginning to work with Pakistani utility companies to reduce power outages and lost revenue caused by outmoded technologies and systemic nonpayment by customers. "These projects … will repair and upgrade key power stations across [Pakistan] that currently operate significantly below full capacity," Mrs. Clinton told an Islamabad news conference. The office of Richard Holbrooke, Washington's special representative to Pakistan and Afghanistan, has cobbled together energy experts in an effort to attract international investment, according to U.S. officials. Washington also started an energy dialogue with Pakistan this month in a bid to find short-term and longer-term solutions to electricity shortages. Mrs. Clinton named a special envoy on energy-security issues, David Goldwyn, to lead the U.S. delegation to Islamabad. Pakistan has developed virtually no new power-production capacity in nearly a decade, despite possessing significant hydroelectric and coal assets, U.S. officials said. Islamabad has also faced difficulties attracting foreign investors. Pakistan suffers an estimated shortfall of about 2,500 megawatts of power. Mrs. Clinton said the U.S. experts will begin rehabilitating power stations along the Indus River. Washington will also help repair 11,000 agricultural irrigation pumps.